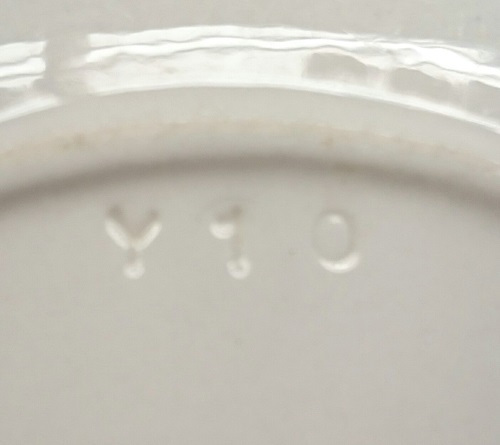 Most of my vitrified large ashets have cryptic numbers and letters stamped into them - I have absolutely no idea what they mean, but thought they should be placed on record. Perhaps they are individual to a particular customer? Any comments happily received. 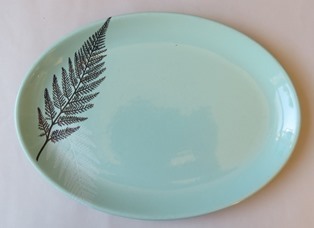 All these plates are almost exactly the same shape; some are photographed from slightly different angles. 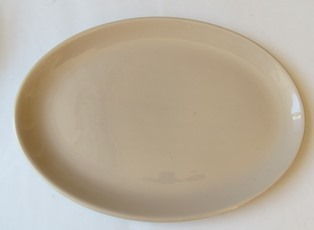 For starters: these first plates are all shape 1631 - my favourite large ashet shape, they are so crisply and professionally made. 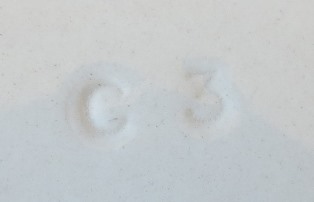 All these imprints are separate from the shape number, and each number/letter is applied separately. Someone did a lot of stamping! When there is a backstamp, I have included it as well. I have not included the shape numbers as that would involve so much repetition. Forgive me if this topic has been raised elsewhere; if so I can't find it. I have more pics of these marks which I can easily add if anyone is interested. Is it only on Vitrified? As you say, these ashets are vitrified shapes. 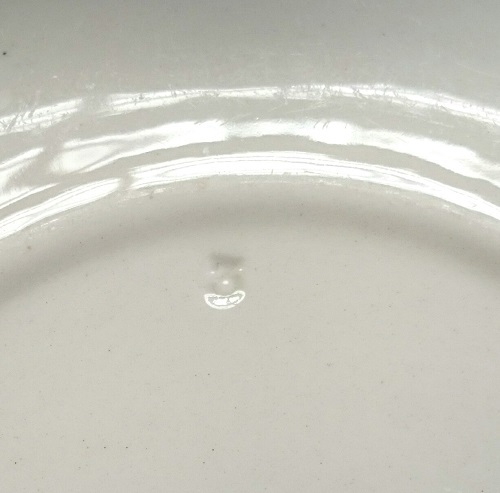 Strange impressed marks of the single-letter-single-number type can be found on plain-coloured Cook & Serve (Viking?) cans too, also vitrified. Eds 19/5/14 I have a Reflections demi with what appears to be 277 impressed. 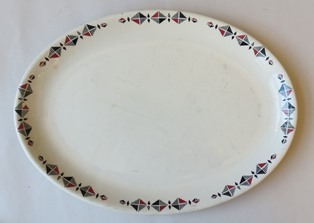 Can anyone produce a piece of earthenware with similar markings? Oh, I see I have one myself! Ca1969 Fleurette tulip stamped "5" . Both these items I think are late 50s, early 60s. It looks like what I have written below may only apply to CUPS because now that I review the above I see some strange alphanumeric combinations of different lengths. Dating pieces with crown and star backstamps has always been a bit of a gamble. 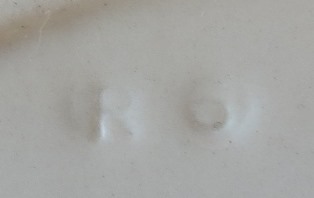 I understand that this mark was used from 1955 but the date at which its use ceased is not known. 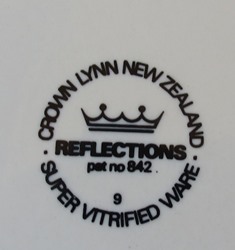 On vitrified ware this mark was replaced with a crown and number mark, with the single digit indicating the last digit of its year, for example 7 for 1967. The earliest year mark I have found is 5 for 1965, but I suspect that on some special lines the crown and star may have been retained longer. 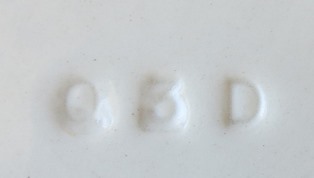 The practice of numbering backstamps began with wares made for Gibsons and Patterson (in about 1962), I believe the reason was for stock control in use in commercial kitchen and dining rooms. 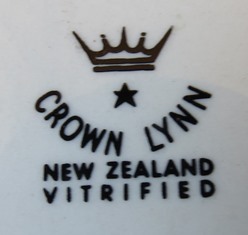 Crown Lynn did attempt other dating systems before those now well-known backstamps. For a time they attempted different systems for dating, using alphanumeric impressed stamps. I have only now started to get a handle on these. I believe the first stamp in an indication of year and second stamp is an indication of year. 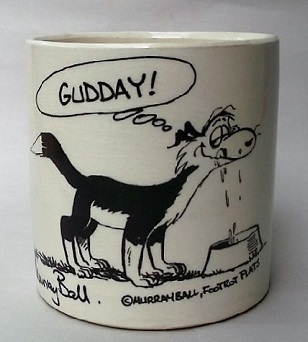 Using that system some new cups (29, that's 2 and 9 rather than twentynine) would date from February (2) 1959 (9). Where letters for part of the mark it is a bit more tricky. The "J" on my Erg cup could conceivably be January or June or July, but I think more likely November, where using a simple number-letter substitution (A=1, B=2 ... J=10 ...) November--the tenth month--is J. One of my other battery monogram cups poses a problem as the possibly incomplete and anyways difficult to read mark could be I0, or 10, or CI or C1 (etc) but if I select one interpretation to match my scheme above it would be C1 for March 1961. Ongoing. I'll look at plain coffee cans again some time. Re: Those mysterious numbers and letters on ashets. One was 8/71 which would represent August 1971. Just to show what it looked like Jeremy !!!! 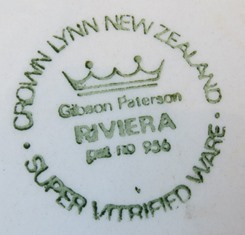 I saw a couple or few 4619s at Hikurangi last week and photographed marks like that, backstamp not impressed. There were three and all either (because the marks are not that clear) 6/71 or 8/71: coincidence or what? I'll need to use computer to add pics but it is occupied atm. As for the impressed marks, I considered the possiblity of a "codecracker" type code with a keywork like Elizabeth Lissaman's year marks but thought that too complex. A through L for the twelve months is much more sensible. The ones on the ashets are much trickier. Bumping this topic for further investigation. Good luck Ev. I was staring at those numbers in the weekend and going hmmmm. Have we asked young Tom Clark? Or Bruce? No I haven't bothered either of those wonderful people for info on this. I feel like such a bother hounding them with questions. 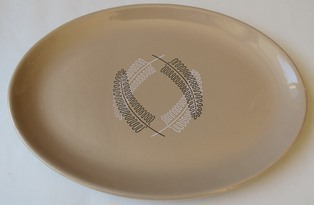 I have noted that all of my 1631 ovals have numbers and letters so I am delving into them today.